This has been out for a couple months now. I'm really kind this isn't limited edition. This came out in a larger format last year (I think) and it was pretty pricey. They reinvented the concept into a smaller format and I jumped right on that. There are 8 "bronzes" in this book. And yes, it's legitimately the size of a small book. It's nice because it allows you to sample and try most of Too Faced's bronzer at a fair price. A full sized bronzer is $30. 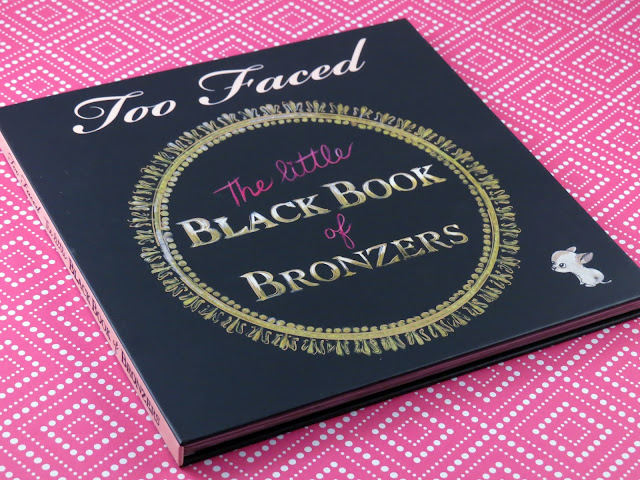 Luckily, I only have one full sized bronzer from this book. Value wise it was wroth it for me. Now the bronzers you get in this book are not full sized. They are sample sizes. If you are someone who uses a large brush in combination with their bronzers it might be hard realistically test/use these. For me I've been able to make almost all of these shades work in one way or another. Milk Chocolate Soleil (light matte bronzer) - this barely showed up on my skin. This would work better for a light skin tones, maybe for contouring. 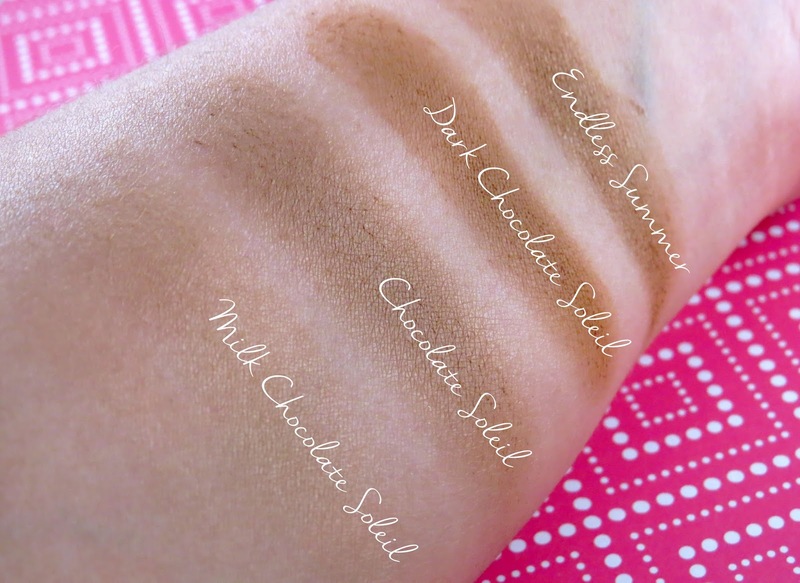 Chocolate Soleil (medium matte bronzer) - I have tried this before and loved it. 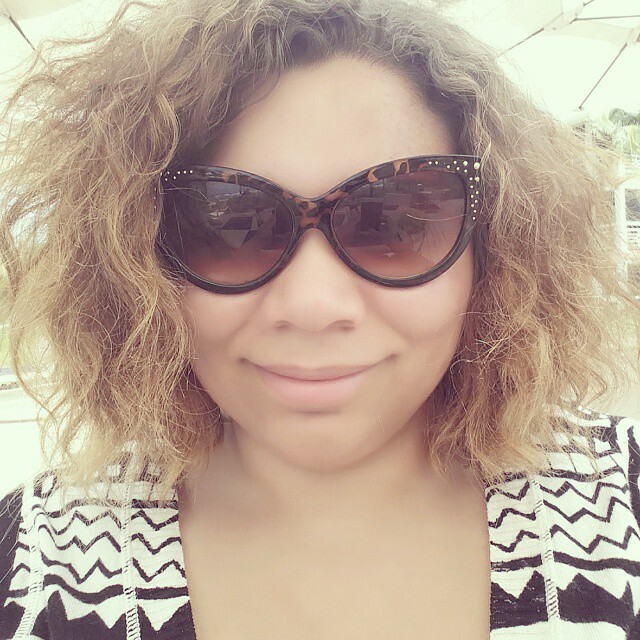 It's a great contour shade for my light-medium skin tone. Dark Chocolate Soleil (dark matte bronzer) - this is relatively new to the Too Faced bronzer line. They didn't have a dark shade before. This still works for me as a contour if I want to really intensify it. Endless Summer (universal bronzer) - Too Faced describes this bronzer as a "universally-flattering bronzer that lasts up to 16 hours". I agree with that. I would say I enjoy this more for contouring over the Chocolate Soleil. 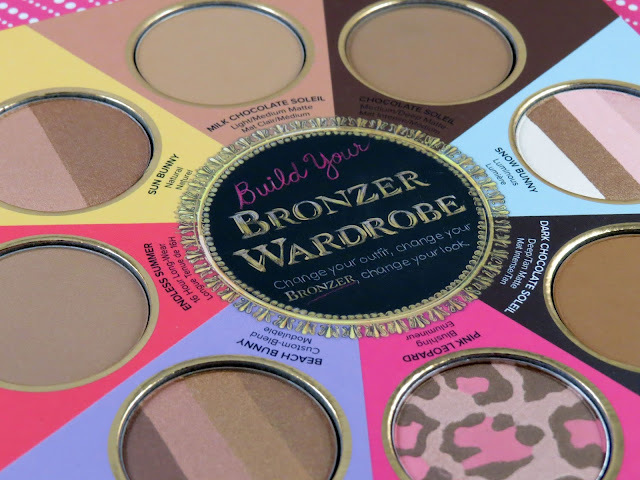 I find this is one of those bronzers that gets over looked on the shelves; I know I did. I'm glad I tried it! Sun Bunny (duo shade satin bronzer) - I actually already have this bronzer (review here). This is a great naturally all over bronzer. 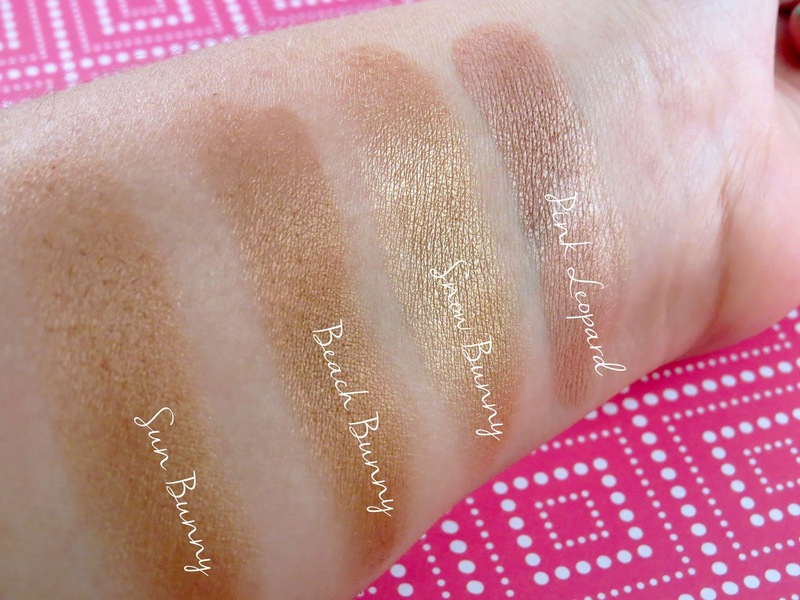 Beach Bunny (4-shade stain bronzer) - very similar to Sun Bunny with a little more radiance to it. 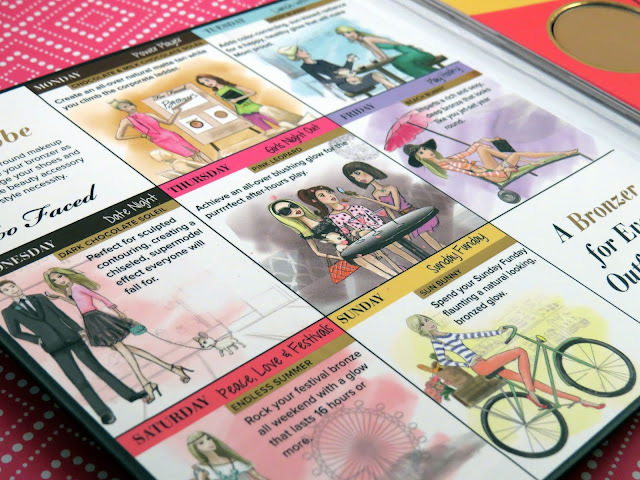 Since has 4 shades in the pan, it's fun and easy to customize it to be more light or dark. I use this as an all over bronzer. Snow Bunny (4-shade shimmer bronzer) - it's described by Too Faced to give you "sunkissed radiance" which I agree with. It's super shimmery and glowy I actually use it as a bronzey highlighter on my upper cheeks. Pink Leopard (trio of pink & bronze) - in my opinion I would not consider this a bronzer but more of a pink-based highlighter. Swirled together with this looks like a rose gold. I could see this being a layered on top of matte bronzers. I never realized how beautiful this was till I owned it!